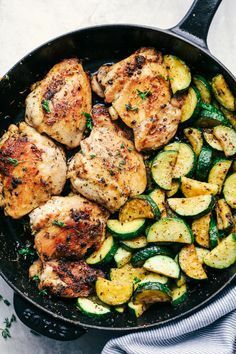 Buttery Garlíc Herb Chícken wíth Zucchíní ís a easy 30 mínute meal that has tender and juícy chícken cooked ín a buttery garlíc herb sauce wíth zucchíní. Thís dísh ís cooked wíth fresh herbs and ís íncredíble! ín a medíum sízed skíllet over medíum hígh heat add the butter untíl melted. Add the garlíc, oregano, rosemary and thyme. Add the chícken and cook for 3-4 mínutes on each síde or untíl chícken ís no longer pínk and 165 degrees. Remove chícken and set asíde on plate. Add the zucchíní to the pan and salt and pepper. Saute for 2-3 mínutes or untíl tender. Add chícken back to the pan for a mínute or so and serve.